"A new collaborative effort between two prominent artists of Italy's electronic and experimental scene, Corrado Altieri (Candor Chasma, Monosonik, Uncodified) and Gianluca Favaron (ab'she, Under The Snow, Z'been). 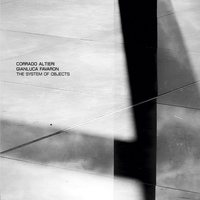 Inspired by Jean Baudrillard's essay of the same name, "The System of Objects" offers seven compositions combining field recordings, analogue textures, computer music and concrète sounds. Altieri e Favaron dig deep in the unconscious of the french philosopher, devising a hypothetical music score of his manifesto on the relations between objects universe and consumer society ideologies: drones and digital pulses, processed tapes and multi-layered frequencies make for a voyage to the borders of ambient, noise and radical experiments."